Since I am le BLONDE fox, it's my business to help you find the right hairdresser in Melbourne to help you achieve your lushes locks to perfection too, otherwise, I wouldn't be living up to my name now, would I? As you know Foxes I've been on a little adventure with different hairdressers about my blonde hair. 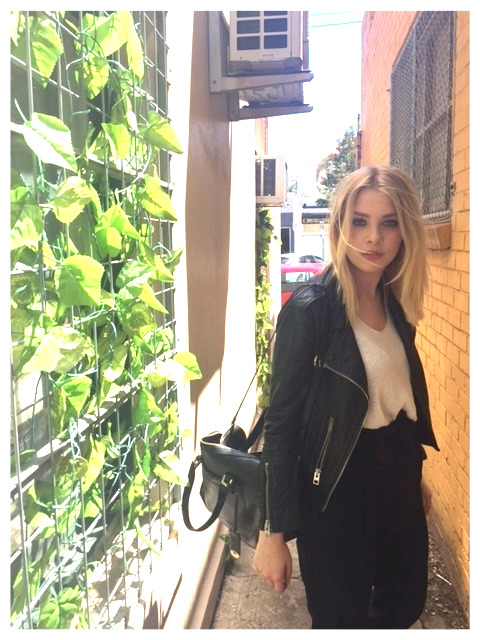 Providing you with blog coverage and a vast range of choices for you to pick your own hairdresser in Melbourne. I've changed hairdressers yet again, but this time I've definitely found love. Over the past 7 months, I've been a regular at Rakis. I first met the team from Rakis last year when I was part of L'oreals colour bond campaign. The whole team at Rakis welcome you with open arms and once you're there, you're treated as if you're family! I'm always greeted with a big kiss on the cheek by the founder and owner Stavros. The environment is beautiful and everyone who works there is not only talented but also wonderful personalities inside and out. Rolf, who is my hairdresser has been taking good care of me. He's the sweetest, understanding, loveliest guy ever! Not only is his personality lovely, but he's an amazing colourist. He takes his time and colours my blonde hair to perfection. Drinks are provided and complimentary treats throughout the appointment, with added laughs and conversation! Rolf does really fine foils and used bleach with Smartbond, the Multi Technique (the name of the bleach itself), to really blend in the colour so the end result is natural looking and grows out into soft and subtle hair colour. For added depth, Rolf used NO. 10.12 Toner and Clear to achieve a lovely creamy colour all over. Finished with a blow dry and a full set of curls brushed out creating that perfect wave. Rolf is so good at this! I love it how he takes the time to curl my hair so perfectly. My hair is healthier than ever since seeing Rolf. Although I get my regular colour touch up, I've also been getting monthly Kerastase Ritual with a ten-minute luxurious scalp massage. This has made my hair healthier, stronger and I've seen it grow quicker than ever before! I can't wait to go back and see my Rakis family! Everytime I visit, I'm treated with so much respect, love and once I leave they put me in the best mood! REVIEW: The New Black Dyson Supersonic Hair Dryer. Is it really worth it? Fashion bloggers, we’re always writing about investment pieces, well what about investing in your hair? The Dyson Supersonic hair dryer has changed my life. It's MIND-BLOWING- literally! How? By drying my hair under 10 minutes. Ever since receiving it last month, I'm now excited to wash my hair, but before using the Dyson Supersonic hair dryer, I dreaded the fact about washing my hair. I was spending over 30 minutes drying my hair, and being hot and flustered after! It was a serious workout drying my hair. Before I get right into the details of this machine, it really has made my life better when drying my hair. Just being so lightweight it makes me look forward to washing my hair and then drying it after. If I'm in a rush too in the morning, I know I can wash my hair and dry it without the worry of being a little late. So let's get into the nitty-gritty about this epic device. 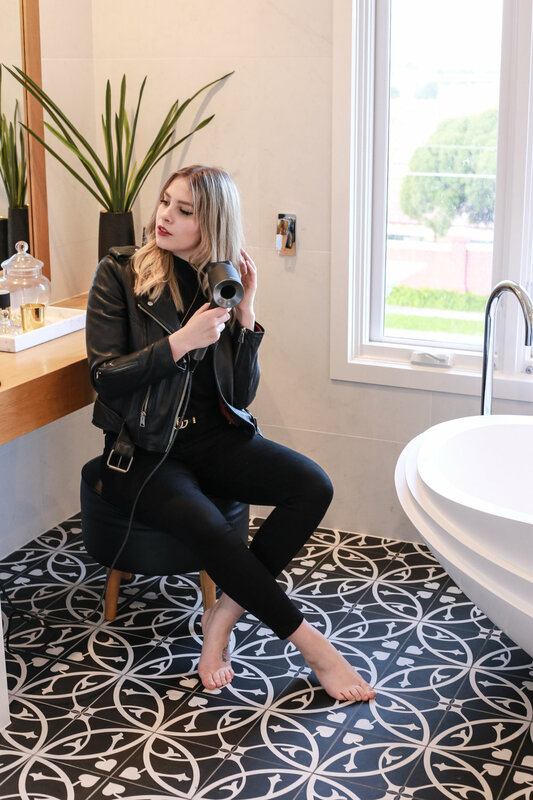 The Dyson digital motor V9 is fast, light and small, and spins up to 110,000rpm with an inaudible frequency, meaning you can literally chat with your friends while drying your hair! It's great when they use this in the hair salon too, you no longer have to shout to your hairdresser while they're drying your hair. The Dyson Supersonic hair dryer uses intelligent heat control to protect hair from extreme heat damage. With its controlled high-velocity airflow, it dries and styles to perfection, and limits exposure to excessively high temperatures, this amazing feature helps preserve your hair's natural shine. This is what's helping dry your hair quicker, but while doing so your hair is protected. There is a microprocessor that is checking the heat of the air every 20 seconds, this is making sure it doesn't overheat and damage your hair. It also comes with magnetic attachments, including two types of concentrator nozzle for smoother, shinier styling and a diffuser for curly hair. It's official, I'm never ever using anything but the Dyson Supersonic hair dryer again! Ever since receiving this amazing piece of technology, drying my hair has become an enjoyable experience. *Disclaimer: this review was written on my own accord, words and blog posts are my own experience. This item was tested out over a span of 31 days and used 3 times a week over the course of 31 days. This is not a paid post, item was gifted. Sometimes, we just don't have the time to spend hours upon hours in front of the mirror, perfecting our look for the day. Especially if you're a busy fox on the go! But of course, you still want to feel beautiful when you step out of the house right? I teamed up with Elizabeth Arden to give you the look I created with their products above. It's simple, quick and flawless. Starting with the base, I always moisturise or use a sunscreen before I put on my foundation; I find using a sunscreen under my foundation gives me double protection throughout the day. I used Elizabeth Arden flawless finish cream makeup in Vanilla 22. The foundation glides on smoothly with the help of the sponge that comes with the foundation. If you want more coverage this is also build-able, but in one go, I could visually see a difference without having to add more product. The compact is great to take with you on the go to touch up, plus it's super gorgeous. Who wouldn't want to pull this beauty out whilst waiting for your cappuccino?! I filled my eyebrows with their eyebrow pencil in Honey Blonde. Finally, an eyebrow pencil that looks natural! This colour is perfect for blondes. I admit in the past that I used to draw on my eyebrows with colours that were too dark and didn't suit my hair colouring at all! Finding the right colours will do wonders for your complexion. Finally, I used the creme blush in honey, not only on my checks but lips too! and if you want to add a little shine add a gloss on top! The packaging is so appealing it's like a little golden gem, and inside is a mini mirror. Completed my look with a winged liner and mascara and we're ready for the day! So foxes, you have no excuse and neither do I when I'm feeling a little lazy. This look only takes 10 minutes! Flawless and beautiful, you won't want to leave the house without your Elizabeth Arden treasures. DISCLAIMER: This article contains sponsored content. Products have been GIFTED by Elizabeth Arden. Collaboration was accepted by myself as I believed that good quality make up pieces should be acknowledged. Every fox needs lovely locks, and keeping my fur in order is a must have throughout the year. I have been through the mill with hairdressers, experiencing from different colours to tragic outcomes and terrible cuts. Then finally one day, after many years of soul searching I met Sonja. The love of my hair's life! Sonja works at OSCAR-OSCAR Chadstone. No lies, no gimmicks, Sonja can transform your dull re-growth into blonde lush locks in one go. I recently saw Sonja for my blonde touch-up, having experienced a full day of relaxation and transformation. As soon as you arrive and sit in your seat, you are treated like an A -lister, it all starts from there. From a menu of an array of hot and cold drinks to even cookies and a neck massage. Sonja will create the colour that is suited for you and from there she sections of the hair with the foils. After foils are in, they wash out the under layer first, as it's already set. From there, we play the waiting game, which goes rather quickly whilst flipping through the magazines. Then once the colour is set we go back to the sink, and this is where it becomes so relaxing. They wash out all the dye and add in a lighter one on the roots. This that's left in for about 10 mins. From there that's washed off followed by a toner for your colour. Whilst this is happening, you are treated to a hand and head massage, which is total bliss! Along with a hot towel on my head, which helps rejuvenate your hair after an intense dye, and super relaxing. Now time to see the end result! Blow-dry time! If you're in need of a pick me up, and a new colour or someone to correctly dye your hair blonde! Sonja from Oscar-Oscar is your girl to see, for chit chats and coffee she's there like your best friend but knows your hair to a strand!